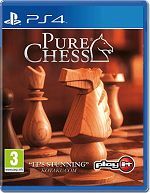 Pure chess puts other games in checkmate! Experience one of the oldest known boardgames on the advanced technology of today. With ultra realistic and unparallel beautiful visuals you can almost reach out and touch the pieces.